Personal histories honouring the diverse heritage of St Albans Masorti Synagogue (SAMS) members. The SAMS Roots project ensures that the community’s unique memories are preserved in the wider community of St Albans and beyond. Below are links to the transcript of each participant’s interview. A glossary is also available for listeners. The interviews were conducted and biographies compiled by Caroline Pearce, a University of Hertfordshire alumna. The transcripts were prepared by Caroline Pearce and Helen Singer, who is a member of the SAMS community. 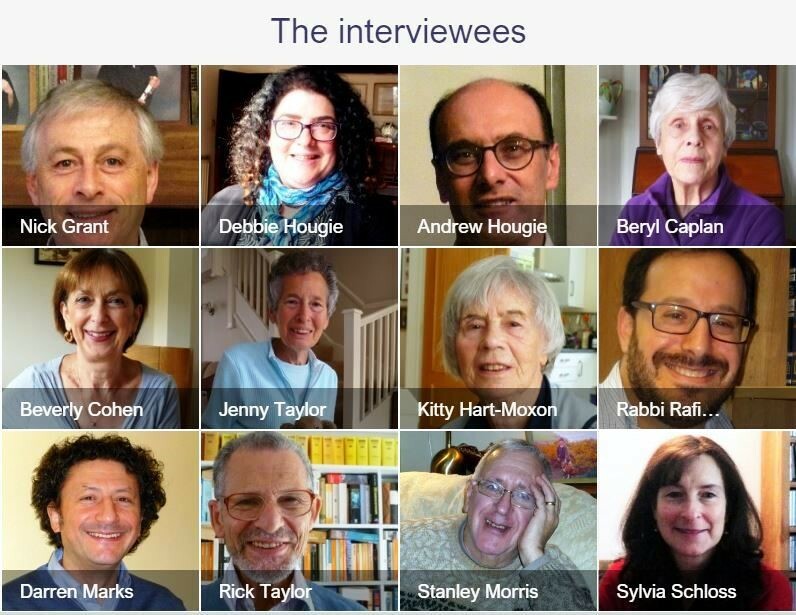 Click on the dropdown lists below to hear the stories from the twelve interviewees where you will also find a short summary and links to the full transcripts. Beryl has been a SAMS member since 2009. In her interview she talks about what brought her to SAMS, her South African father and growing up during wartime. Beverly Cohen was born in Yarmouth, Nova Scotia. In 1974 she moved to Brighton where she lived until 2013 when Hemel Hempstead became her home. She recalls finding SAMS, a happy childhood and her Russian roots. Nick Grant and his wife Sarah are among the founder members of SAMS and have lived in St Albans for more than forty years. Nick was SAMS’ first Treasurer. In his interview he speaks about SAMS’ beginnings and learning about his family’s history from an unexpected source. Kitty Hart-Moxon OBE has been a member of SAMS since 2006. Auschwitz survivor and Trustee of the Holocaust Educational Trust, Kitty has travelled extensively speaking about her experiences and leading trips to former concentration camps. In 2003 Kitty was awarded the OBE for services related to Holocaust education. She talks about escaping a death sentence, and why she wanted her tattooed identification number removed and preserved. Andrew Hougie joined SAMS in 2013. In his interview he talks about his Sephardi roots, his Iraqi Jewish family and tells the story of a Turkish carpet. Debbie Hougie has been a SAMS member since 1996. In her interview she talks about what SAMS means to her, her Lithuanian roots and the importance of maps. Rabbi Rafi Kaiserblueth was born in Puerto Rico to South American parents and grew up in the USA. After visiting SAMS in 2007 as a student rabbi, Rafi completed his studies and became SAMS’ full-time rabbi. In his interview Rafi talks about his European roots, his love of America, and becoming a rabbi. Darren Marks has been a SAMS member for several years. Darren created – with the help of his family and others in the community – the wooden inscription above the shul’s Ark, which translates as ‘Behold, how good and how pleasant it is for brethren to dwell together in unity’. Darren talks about his connections to Bevis Marks Synagogue, an 18th-century boxing champion and a Russian conscript. Stanley Morris has been a SAMS member since moving to St Albans eighteen years ago. In his interview he talks about finding SAMS and learning about his family’s Lithuanian and Polish roots. Sylvia Schloss has been a SAMS member since its early days. In her interview she talks about growing up in north London, her parents’ roots and memories of her step-grandfather, Otto Frank, father of Anne Frank. She also talks about the importance of her mother Eva Schloss’s published account of her wartime childhood: The Promise. Jenny Taylor was born in St Albans shortly after the Second World War. A SAMS member since 1994, Jenny recalls the community using rented space for religious services before acquiring its own building. She also relates stories about her family’s history, a recently discovered cousin and her tenuous connection to Jack the Ripper. Rick Taylor has lived in St Albans since he was a baby, when his family left Highbury for Hertfordshire, to be away from the capital during the Second World War. Rick and his wife Jenny have been SAMS members since 1994. Rick talks about SAMS, his schooldays, his grandmother’s status as an enemy alien and an encounter with a German soldier. Click to see the full playlist in Soundcloud. Click to visit the SAMS Roots page.